In Leadfeeder there are basic feeds and custom feeds. 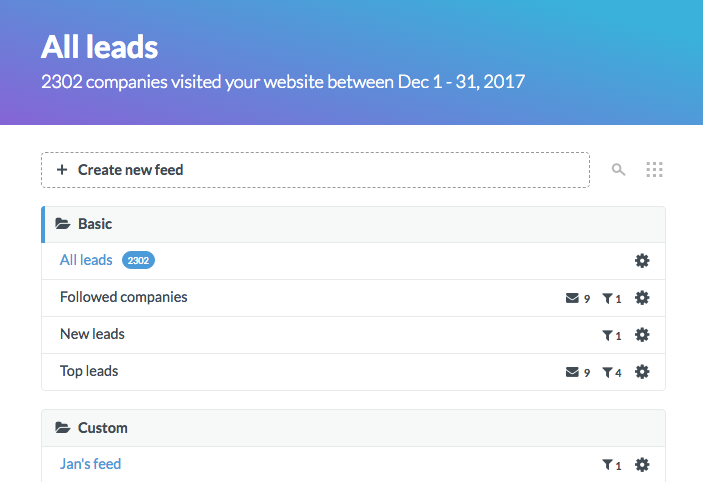 Basic feeds display a list of leads (companies) that meet certain criteria set by Leadfeeder. Custom feeds are feeds that you customise yourself. This article explains more about custom feeds and gives you some examples. The image below shows the list of basic feeds. When you create a custom feed it appears below the basic feeds. The purpose of any feed in Leadfeeder is to segregate lead data so you can see the most critical information quickly and easily. Custom feeds allow you to quickly see companies that match certain criteria. For example, they might have visited certain web pages, be located in a particular country or they might be from a certain industry. You can select your own criteria. Will my custom feeds be visible to my colleagues? How can I manage my feed-based email alerts? What does the basic feed "New leads" show?